This is the first and welcome book by Roy Suenaka, an early pioneer of American aikido with impressive credentials: he studied both under aikido's founder Morihei Ueshiba O'Sensei, as well as Koichi Tohei. Karate-ka will also find the book interesting since it details the author's studies in other martial arts, most notably karate under the Okinawan legend, Hohan Soken. The details and history of Suenaka's background are laid out in the book's initial biographical section, which gives Suenaka's perspective on the early years of aikido in Hawaii, his bringing aikido to Okinawa, the rift that developed between Kisshomaru Ueshiba and Tohei, Tohei's separation from the Aikikai (Usehiba's Association), and the early development of Tohei's Ki Society, in which Suenaka was one of the first shihan (senior instructors). Drawing on his study under both O'Sensei and Tohei Sensei, Suenaka affords the reader rare insight not only into the methods and personalities of these two men, but also into the ongoing debate concerning whether aikido is more a philosophical, spiritual discipline than an effective means of self-defense. The style is informal and highly readable mixed with wit, humor, and colorful, often amazing stories -- such as Ueshiba's demonstrations of ki -- all aptly portrayed by co-author Christopher Watson. These stories alone are worth the price of admission. The second half of the book is devoted to etiquette, basic exercises and techniques of Suenaka-Ha Tetsugako-Ho Wadokai Aikido. Many photos and detailed descriptions are included. This is not just another "How To" of basics section. Suenaka's emphasis is on effective technique, including use of atemi (striking). Suenaka also illustrates what he considers to be incorrect technique. Clearly Sueneka believes aikido to be effective as a self-defense art. The first half of the book complements this assertion through many real- life examples of street self-defense and dojo confrontations. The dojo episodes are significant since Suenaka was the first successfully to introduce aikido to Okinawa. Confrontations and challenge were inevitable and his success is testimony to both Suenaka's and aikido's technical prowess -- something his background in judo, boxing and karate assuredly helped to hone. Undoubtedly these often tense early adventures also helped to solidify his continued emphasis on effective technique. The faults of the book are few. The first is that static photos can never portray the flow of movement and technique that is at the heart of the art. Thus the casual viewer may find it difficult to judge some aspects of Suenaka's technical proficiency. Perhaps this flow can only be experienced through actual observation and participation, or to a lesser extent through video. The other limitation of the book is that the second technical section does not include weapon defense, self-defense against kicks, throws and other techniques, although Suenaka notes that these aspects were deliberately omitted for the sake of brevity. 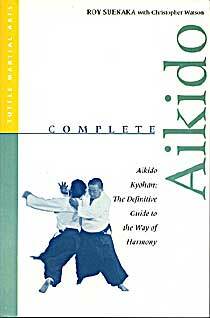 Nevertheless, their omission prohibits the book from truly fulfilling the promise of its title, Complete Aikido. No doubt the reader can look forward to additional publications by the authors which will cover the areas not included in this first text.